As the leading human rights organization for all individuals with Down syndrome, the National Down Syndrome Society believes the importance of caregivers should not be underestimated or go unnoticed, which is why we are happy to celebrate the month of November as National Caregivers Month. Thanks to the advancement of medical innovation and the assistance of our caregivers, adults with Down syndrome are now routinely living into their 50s, 60s and beyond. For many individuals, this long and vibrant adulthood is marked by an array of milestones such as moving out of the family home, seeking a meaningful career, becoming an uncle or an aunt, finding love, traveling to new places and trying new and exciting things. The joys that these experiences bring are often coupled with the challenges that adults with Down syndrome often encounter with advanced aging. One of the most serious and life-altering concerns individuals with Down syndrome face as they grow older is the increased risk of the of development Alzheimer&apos;s disease. The initial diagnosis of Alzheimer&apos;s disease can be overwhelming. Families and caregivers of adults with Down syndrome can find this diagnosis particularly devastating, as it is often marked by a profound grief for the loss of abilities that were so hard-earned over the individual&apos;s lifetime. 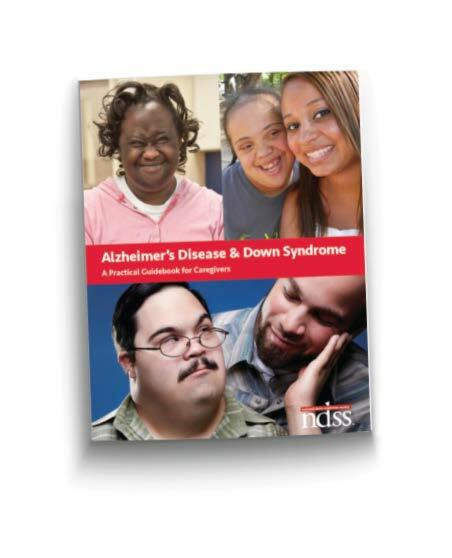 For this reason, NDSS partnered with the Alzheimer&apos;s Association and National Task Group on Intellectual Disabilities and Dementia Practices to author a guidebook specifically for those caring for an individual with Down syndrome diagnosed with Alzheimer&apos;s disease. NDSS wants to show these caregivers that NDSS is with them - through every step of the way and provide resources about Alzheimer&apos;s disease gathered into one collective guide. The guidebook speaks to the specific concerns related to adults with Down syndrome and Alzheimer&apos;s disease and the caregivers who love and support them. No matter how informed one might be with the increased risk of Alzheimer&apos;s disease for individuals with Down syndrome, many people are unprepared with the reality of this diagnosis. Family members, loved ones and caregivers may find themselves in a state of disbelief when they witness changes occurring. This can be a very emotional time as individuals, caregivers and families work to fully grasp the implications and impact of this diagnosis. Knowledge is one way to reclaim some power over situations where total control is not possible. This guidebook was written to empower caregivers and families with knowledge and guidance about the connection between Down syndrome and Alzheimer&apos;s disease, how to carefully and thoughtfully evaluate changes that may be observed with aging and, lastly, how to adapt and thrive as a caregiver when a diagnosis is made. ABOUT THE AUTHOR: Sara Hart Weir, MS, is president & CEO of the National Down Syndrome Society based in New York City and Washington, D.C.